Brillante Mendoza directs a cast including Allen Dizon and Elijah Filamor. Arriving hot on the heels of Eric Matti’s similarly plotted but decidedly more entertaining BuyBust, Brillante Mendoza’s Alpha, the Right to Kill is a down and dirty frontline take on Filipino President Rodrigo Duterte’s controversial war on drugs. Seen from the point-of-view of SWAT commander Espino and his impoverished informant Elijah, the film purports to represent both sides of the violent confrontations that have ravaged Manila’s slums since Duterte came to power in 2016. But anyone with even a passing knowledge of the issue, will see Mendoza’s film as a gross misrepresentation of the fundamental problems facing millions of Filipino citizens, in favour of a simplified, sanitised cops and robbers tale. The film won the Special Jury Prize at last month’s San Sebastian Film Festival. 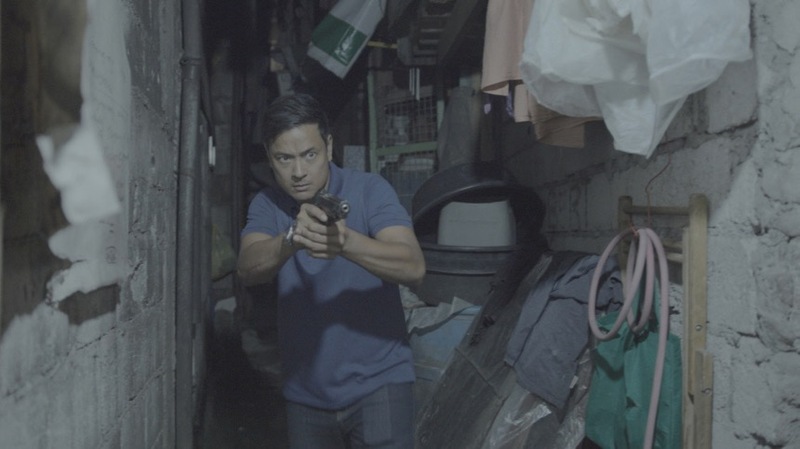 Allen Dizon plays Espino, who on the surface appears to be a clean-cut model police officer, risking his life every day to clean up the streets in the crime-riddled slums of the Philipine capital. He has a wife and children, he participates in school activities and takes down the bad guys without hesitation. What we soon learn, however, is that Espino is deeply corrupt, regularly pocketing cash and drugs from crime scenes, incriminating suspects and falsifying evidence to justify the trigger happy actions of him and his team and elevate his family's already comfortable lifestyle. Elijah Filamor plays a low-level drug pusher, Elijah, operating in one of the city’s many favela neighbourhoods. He has a wife and newborn baby, who know precisely how he makes his money, but need the income as they struggle desperately to make ends meet. Subject to routine body searches and pat downs, Elijah uses a variety of tactics, ranging from homing pigeons to drug-stuffed mangoes to his own baby’s diapers, to transport methamphetamine across the city to meet the supply and demand. But at the end of the day, he answers to Espino, informing on his rivals and superiors in return for backhanders and staying out of the firing line himself. Mendoza’s depiction of his home country is one ravaged by a drug epidemic, where everybody is either an addict, a dealer, or a uniformed law enforcer out to stop it - or at least profit from it. Occasionally a rogue journalist gets a question to the police chief about the legitimacy or effectiveness of their brutal, often shoot-first tactics, but these criticisms are quickly brushed aside as acceptable methods causing only limited collateral damage. Unfortunately the headlines coming out of the Philippines since Duterte came to power two years ago paint a very different picture. Perhaps the biggest problem with Alpha, the Right to Kill is that, taken on its own and considered in isolation to the real-world facts it supposedly represents, Mendoza has delivered a sufficiently tense and involving thriller. There are few surprises to its dirty cop comes a cropper plot, but it is well acted and effectively executed, creating an all-too convincing sense of place. The set pieces are tight and exciting, while the characterisation is nuanced enough for both the film’s leads to evoke our sympathies despite their illegal activities. However, what the film fails to do is present a sufficiently balanced and truthful picture. Were Mendoza to be believed, the slums are populated solely by a faceless mass of pimps and pushers, where everyone is guilty of something and if caught, is submitted to due process and a fair hearing. The millions of innocent civilians are nowhere to be seen, nor is there any outright acknowledgement of Duterte’s open call to his population to kill anyone even suspected of being a drug dealer…or even addict. The thousands of extrajudicial executions in the country has been widely condemned by Human Rights groups around the world, to which the President simply responded by openly questioning whether or not drug addicts even counted as human. Some might argue that Mendoza is using satire to make precisely the opposite point, but his support for Duterte is widely documented. He directed the President's State of the Nation Address in 2016 and 2017, using a wide variety of low-angle and extreme close-up shots to emphasize, in his words, the leader's power and sincerity. But Alpha plays like Death Squad propaganda, opening and closing on military style parades where senior police officers are decorated for their heavyhanded, murderous efforts. Matti’s BuyBust may play like an endless beat-em-up video game, as indestructible adversaries fight to the death all night long, but at least it acknowledges that most people are just trying to survive, and it’s the authorities, not the cartels, that are posing the deadliest threat. Mendoza’s arthouse creds appear to be getting him a pass - even accolades - from audiences and juries aware of his reputation as a filmmaker, but perhaps less familiar with the politics at play in his films. Just as Duterte's policies play fast and loose with the lives of his constituents, so too does Alpha, the Right to Kill bend the truth to suit its director's own political agenda.